This risotto is dressed to impress! 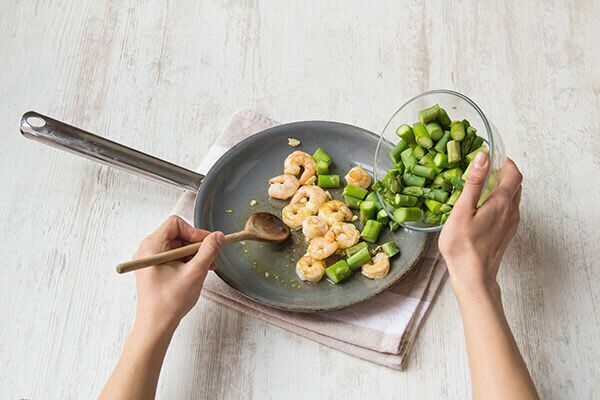 We’re folding nutty Parmesan, sautéed asparagus, and juicy shrimp into this creamy dish. This dinner may be simple, but it’s elegant enough for any dinner party. Prep the ingredients: Bring 4 cups water and the stock concentrate to a simmer in a small pot over low heat. Remove the shrimp from the fridge and bring to room temperature. Trim and discard the bottom inch from the asparagus, then cut into 1-inch pieces. Halve, peel, and finely chop half the onion. Finely chop the garlic. Zest, then halve the Meyer lemon. Cook the onion: Heat a drizzle of olive oil in a large pan over medium heat. Add the chopped onion to the pan and cook, stirring for about 5 minutes, until soft. Add half the garlic and cook for another 30 seconds, until fragrant. 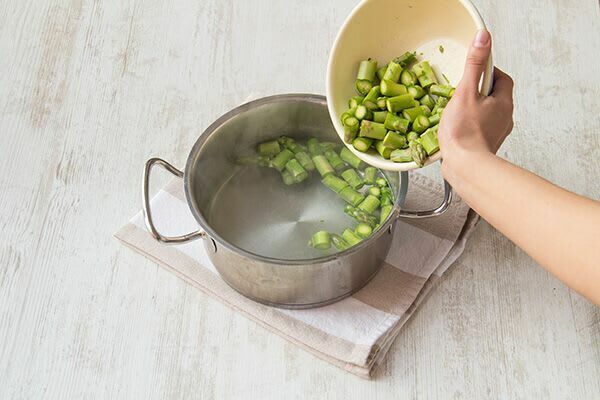 While the onions cook, drop the asparagus into the simmering stock for 1 minute, until bright green. Remove with a slotted spoon and rinse under cold water. 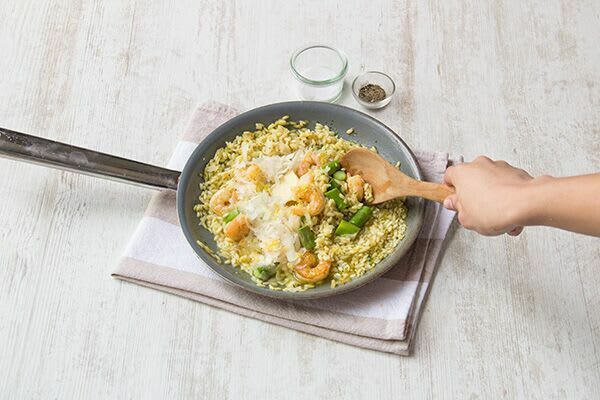 Cook the rice: Stir the arborio rice into the onion mixture and stir to coat the rice. HINT: If you happen to have some white wine handy, this would be a great time to add a splash! Just let it bubble until nearly evaporated. Begin adding the hot stock to the pan in ¼ cup increments, stirring between each addition, until the liquid is absorbed. Continue until the rice is al dente and a loose sauce has formed, approximately 25-30 minutes. 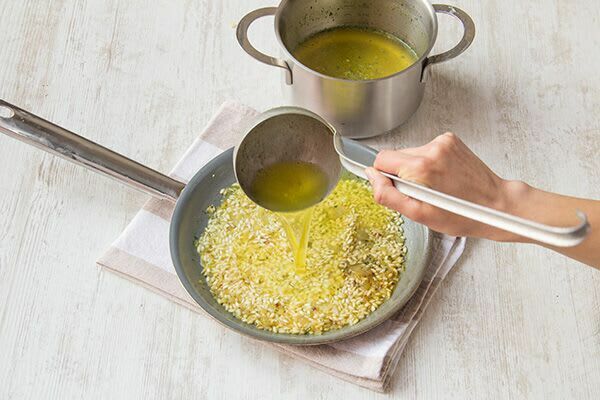 In between stirrings, heat a drizzle of olive oil in a separate medium pan over medium heat. Add the shrimp, remaining garlic, and asparagus and cook, tossing for 3-4 minutes, until the shrimp are opaque. Season with salt and pepper. 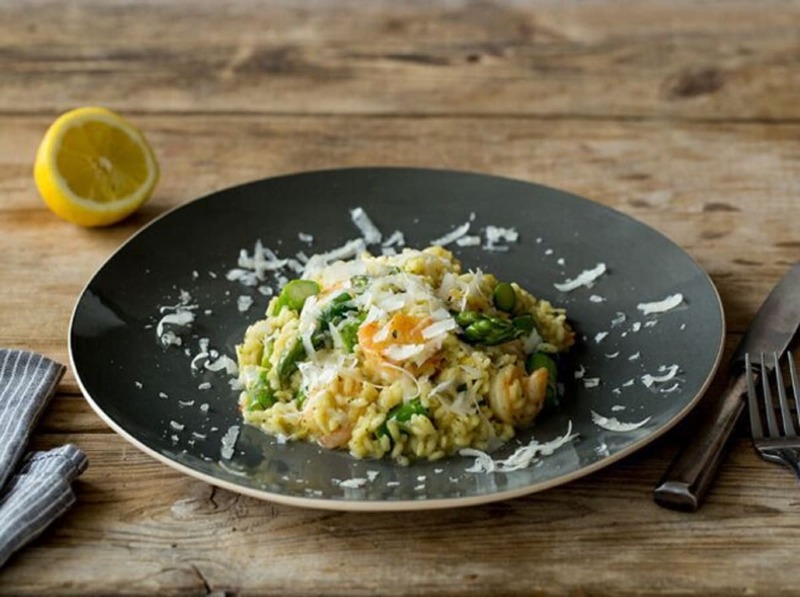 When the risotto is tender, stir in the shrimp, asparagus, a pinch of lemon zest, half the Parmesan cheese, and the butter. Season with salt, pepper, and a squeeze of lemon. Sprinkle the risotto with the remaining Parmesan cheese and enjoy!